Back cover blurb: What if the figure that haunted your nightmares as child, the myth of the man in the woods, was real? He'll slice your flesh. Your bones he'll keep. Twenty years ago, four teenagers went exploring in the local woods, trying to find to the supposed home of The Bone Keeper. Only three returned. Now, a woman is found wandering the streets of Liverpool, horrifically injured, claiming to have fled the Bone Keeper. Investigating officer DC Louise Henderson must convince sceptical colleagues that this urban myth might be flesh and blood. But when a body is unearthed in the woodland the woman has fled from, the case takes on a much darker tone. The disappeared have been found. And their killer is watching every move the police make. The Bone Keeper is a figure of childhood nightmares and local legend. He is a mythical being, most certainly not real. At least, that's what four teenagers believe when they enter local woods in search of him, whilst trying to scare each other. So when DC Louise Henderson and her colleague DS Paul Shipley are called to the scene of a young woman fighting for her life, claiming to have fled from the Bone Keeper, they are more than a little bit sceptical. Louise does think that there is something in the local legend though. Too many people have claimed to have seen it for there not to be something. Paul is not so easily convinced and thinks he can identify a prime suspect straight away. As the woods are identified are a prime area for the investigation, it quickly becomes clear that the attack on the young woman; Caroline, was not a lone one. It is also very clear that she was not supposed to survive. As the police realise they are looking for a serial killer, Louise is convinced that the Bone Keeper, whoever he/she/it is, is their perpetrator. But can she convince her colleagues of this before they strike again? I was scared I might miss Murphy and Rossi when I learnt that Luca had written a stand-alone novel from his regular series but DC Louise Henderson and DS Paul Shipley are two characters that I would really love to see feature in a future novel. 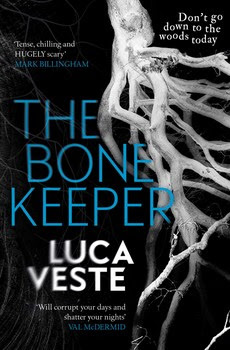 Luca has gone for a darker, scarier novel than usual with the Bone Keeper. It is creepy, chilling and thrilling and I couldn’t have loved it anymore. The Bone Keeper is available from 8 March 2018.